Balanced Scorecard - What is the Balanced Scorecard? Learn more about how Balanced Scorecard Software can help your business. The Balanced Scorecard, referred to as the BSC, is a framework to implement and manage strategy. It links a vision to strategic objectives, measures, targets, and initiatives. It balances financial measures with performance measures and objectives related to all other parts of the organisation. It is a business performance management tool. It was originally published by Dr Robert Kaplan and Dr David Norton as a paper in 1992. And then formally as a book in 1996. Both the paper and the book led to its widespread success. It is interesting to note that although Kaplan and Norton published the first paper, they were anomalously referenced in a work by Art Schneiderman who is believed to be the BSC creator. So it’s more than just financial measures? Correct! The major difference that Kaplan and Norton introduced into this methodology is the ‘balance’ across all organisational functions. The problem back then, and still today, is that most companies focus on financial measures. For example, revenue growth and profitability. By looking at an organisation across four ‘Perspectives’ a causal relationship between investment and financial outcome can be defined, measured and managed. The BSC is not just a scorecard, it is a methodology. It starts by identifying a small number of financial and non-financial objectives related to strategic priorities. It then looks at measures, setting targets for the measures and finally strategic projects (often called initiatives). It is in this latter stage where the approach differs from other strategic methodologies. It forces an organisation to think about how objectives can be measured and only then identifies projects to drive the objectives. This avoids creating costly projects that have no impact on the strategy. The ‘balance’ is brought about by a focus on financial and non-financial objectives that are attributed to four areas of an organisation. These are the Perspectives. They are: Financial, Customer, Internal Processes and Organisational Capacity. Questions often arise about the four Perspectives described in the methodology. Why should we only look at Financial, Customer, Business Process and Organisational Capacity? Why not include Health and Safety? The answer is, of course, there is nothing stopping us. The four perspectives are simply a framework. However, over decades of use it has become clear that they work. More importantly, there is a causal relationship between the perspectives. Working from the bottom to the top: Changes in Organisational Capacity will drive changes in Business Processes that will impact Customers and improve Financial results. The causal relationship may not be guaranteed if a new perspective is added. The result might be a useful scorecard, but it would not, by definition, be a balanced scorecard. The high-level financial objectives and financial measures of the organisation that help answer the question – How do we look to our shareholders? Financial objectives are usually the easiest to define and measure. However, creating a financial objective, for example, Improve Profit, rarely provides a clue as to how to achieve the objective. by linking objectives from the lower levels in the model, we begin to see exactly where to define projects and make investments. Objectives and measures that are directly related to the organisation’s customers, focusing on customer satisfaction. To answer the question: How do our customers see us? It is always important to take a step outside and view your company or organisation from your customers view point. You need to understand what they want from you, not necessarily, what you can do for them. Objectives and measures that determine how well the business is running and whether the products or services conform to what is required by the customers, in other words, what should we be best at? Some of the biggest cost items can be reduced by streamlining internal processes. This is also the best area to focus on new and creative ideas. Objectives and measures concerning how well our people perform, their skills, training, company culture, leadership and knowledge base. This area also includes infrastructure and technology. Organisational Capacity tends to be the area where most investment takes place. It answers the question: How can we improve and create value? The real value of the Perspective approach is that it provides a framework to describe a business strategy. It focuses on objectives and measures that both inform us about progress and allow us to influence activities to achieve the strategy. The framework is often presented in the form of a Strategy Map, as shown below. The four scorecard perspectives are in a specific order and contain strategic objectives that contribute to a Vision and Mission. The objectives are linked in a causal way from the bottom to the top. The Strategy Map provides a very powerful tool allowing the user to talk about the causal impact of investment at the bottom to improved financial results at the top. What is interesting here is that the diagram has been created by a software tool. Software is not required, but it helps. Furthermore, good software tools will allow a user to ‘drill down’ to the underlying data should the need arise to question a specific activity, objective or performance measure. Strategic objectives turn a passive strategy into an active one. An active strategy is one that motivates and drives people to do their best. It is not an additional or separate activity bolted on the side or something to be done when time allows. In his book, The Institute Way, Howard Rolm describes the balanced scorecard system and sums up Strategic Objectives by saying: “Strategic Objectives are considered the DNA of the BSC system” Rolm recognises that in any strategic planning process, the way to bring a strategy alive is to create meaningful Strategic Objectives. Don’t be fooled into thinking strategic objectives are just part of corporate executive slide ware. Strategic objectives apply to all levels of an organisation. The statements used may be different in nature, but their impact will be the same. A corporate strategic objective may be more encompassing, for example, ‘Improve Customer Satisfaction’. Whereas a business unit or department level may be more specific for example, ‘Improve customer satisfaction through better customer contact’. And finally, at an individual level, the strategic objective may be more specific still, for example, ‘Improve customer satisfaction by spending at least 40% time on the customer site’. There is an interesting observation concerning this ‘personal objective’. An assumption has been made that spending 40% of their time on a customer site is a desirable activity. That is, it will improve customer satisfaction. In this case the relationship between improved customer satisfaction and spending time on a customer site has been considered valid. Creating performance measures is not a simple task, especially when there are complex cause and effect relationships. For more information on this subject see our white paper ‘Developing Meaningful Key Performance Indicators’. One of the most common pitfalls seen when creating Strategic Objectives is to describe projects rather than objectives. For example, it may be a strategic imperative to “Create a new CRM system and roll it out”. This, however, is not a Strategic Objective. The Strategic Objective that might include this project could be “Improve customer service through tools and technology”. This is not a case of semantics either! “Create a new CRM system and roll it out” is a project that will come to an end; it is not a continuous improvement objective. The only way to measure it is to check milestones have been achieved and the project has been completed. There is nothing about the project that demonstrates a performance improvement. It is the outcome of an activity, that demonstrates a performance improvement. Projects and initiatives have a place in performance improvement, they drive strategic change. However, it is important to ensure we are not doing projects for project sake. The reason for the project must be clear and the ‘outcomes’ of the project must be clearly measurable. In this way, they can relate back to strategic objectives. Strategic objectives are the building blocks of a good strategy. They give clear guidance to the organisation as to what is important. Through description and cascade, they provide the means to ensure everyone is involved and aligned. Once created, input to a Scorecard comes in the form of Performance Measures, often referred to as Key Performance Indicators (KPIs). A KPI provides information an organisation requires to determine whether it is performing well or not. Unfortunately, in some organisations, KPIs have often become indistinguishable from operational measures. Organisations frequently take the view that everything should be measured and reported on. A KPI is a Key performance indicator. It is one of a small number of measures that are designed to reduce the complex nature of organisational performance and turn it into something that can be understood easily and acted upon quickly. Much in the same way as a doctor or nurse will monitor pulse rate and temperature to determine the overall health of an individual, managers can monitor KPIs to determine the health of an organisation. Where to start is entirely dependent on the strategy an organisation is deploying at the time. There must be a direct relationship between what an organisation is trying to achieve (the strategic objectives) and what is being measured to determine progress towards the objective. Clearly, there will be a lot of operational measures and some of these may contribute data to the Key Performance Indicators, but operational measures should be considered as ‘housekeeping’ and ‘good practice’ and should not be confused with KPIs. The approach gives us the framework to take a ‘balanced’ view across an organisation and define strategic objectives in the four perspective areas together with the associated KPIs. We must be careful not to define too many strategic objectives. It is better to focus on a small number of things where a structure can be put in place to influence behaviours and outcomes rather than to spread the workload so thinly that nothing gets achieved at all. Business strategy consultants Franklin Covey put it very well: If your strategy has 3 objectives you will succeed in all 3, if it has 4-10 objectives you will succeed in 1-2, if it contains more than 10 objectives you will succeed in none. A simple case of the law of diminishing returns. Finally, KPIs must contain both leading and lagging measures. Most strategic plans concentrate on lagging measures. Why? Because they are easy to measure and they are accurate. If I want to lose weight, I get on the scales. This gives me proof positive if I have succeeded or not. It does not give me any help to succeed. If I measure how many times I go for a run and how much I have eaten (and plan for this) then I have put in place two leading measures that will help me succeed. Leading measures are harder to identify but they are the only measures that can be influenced and therefore make a difference. We must not underestimate the importance of leading measures when creating a Scorecard, defining our strategic objectives and choosing our Key Performance Indicators. Companies, organisations and governments across the world successfully use the BSC. it is a business performance management and performance measurement system combined. Organisation size is not a consideration, although the BSC is used by over 50% of the largest companies in the world it is also used by countless small to medium sized companies as well. The only restriction applicable to the BSC is the organisation has to be established and in place for several years. The BSC does not work well for start-up companies. Some well known organisations that use the balanced scorecard include: Thompson Reuters, Volkswagon, Philips Electronics, UPS and the FBI. Organisations often begin the scorecard process by reading one of the many books on the topic, attending a seminar, or doing web research. There are many resources for introductory education and training. Once an organisation has committed to the balanced scorecard model, a third-party facilitator can be brought in to manage a strategy workshop and bring an unbiased view to the scorecard development process. Scorecard development can be very rapid (a few weeks), or as long as a year, depending on the scope and complexity of the scorecard and organisation. Many organisations elect to go with a rapid or intermediate approach, which ensures project momentum and recognise score-carding is an iterative process. It is often better to make and correct mistakes early while an organisation is still excited about the methodology. Initial scorecard work is typically done with Microsoft Excel, PowerPoint, or Word. As the scorecard matures, the methodology is rolled out to the rest of the organisation. The goal is to connect all employees to the organisation’s strategic objectives by using individual or group measures. A software tool will be required to do this efficiently. The premise of the methodology is to provide an on-going, living framework that is communicated to the whole organisation. The scorecard needs to be sustainable and easy to roll-out. Scorecards should leverage technology to provide automation as far as possible. Ultimately, the scorecard should become part of the organisation’s culture and employees’ work experience. 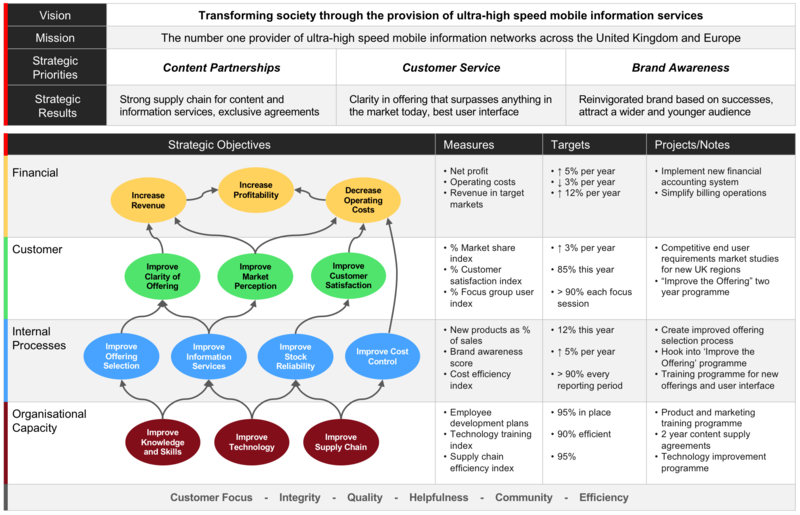 An easy to deploy web-based system will allow for rapid roll-out and a sustainable scorecard. Once the scorecard is developed, it is important to cascade it into the organisation. This will help link groups and individuals to the strategy. Everyone needs to understand the cause-and-effect relationship and how it connects to the organisation’s overall performance. The goal is to translate the strategy into the staff’s “everyday language” and identify measures of success that link to the overall strategic direction. Look for a solution where development and deployment is done through a web browser. Cross-browser compatibility is essential. Solutions using the latest developments in web technology are always preferable. Select a solution that is extremely easy-to-use. Choose a product that functions, as far as possible, like desktop software. Look for products where data can be entered through the web interface, uploaded from a CSV file, or automated with a database connection. Products should be as easy to use as browsing a web page or shopping online. The key to a good design is the strategy map. 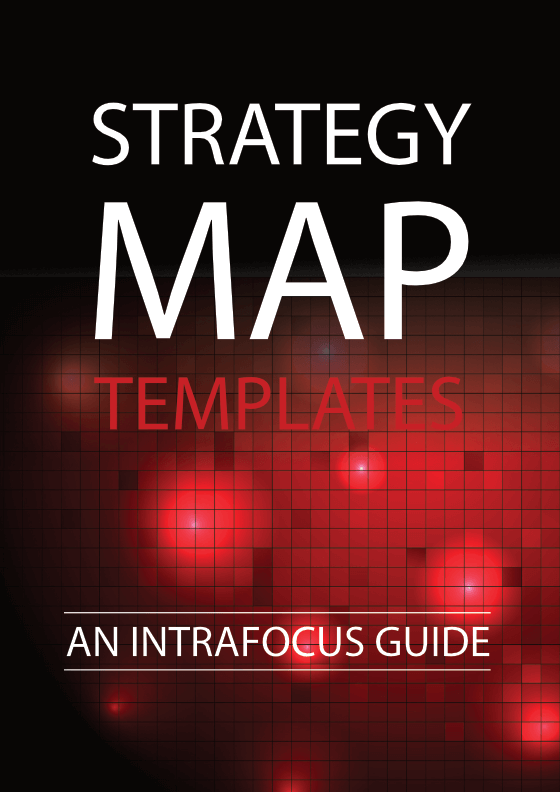 Any product selected should be able to create strategy maps with drill-down capabilities. Strategy maps often start out as a blank canvas to which you add images, shapes, gauges, graphs, text, and numbers to create a visual representation of your data. Once you make a strategy map, however, the colours and numbers should automatically update based on the real data in your system. 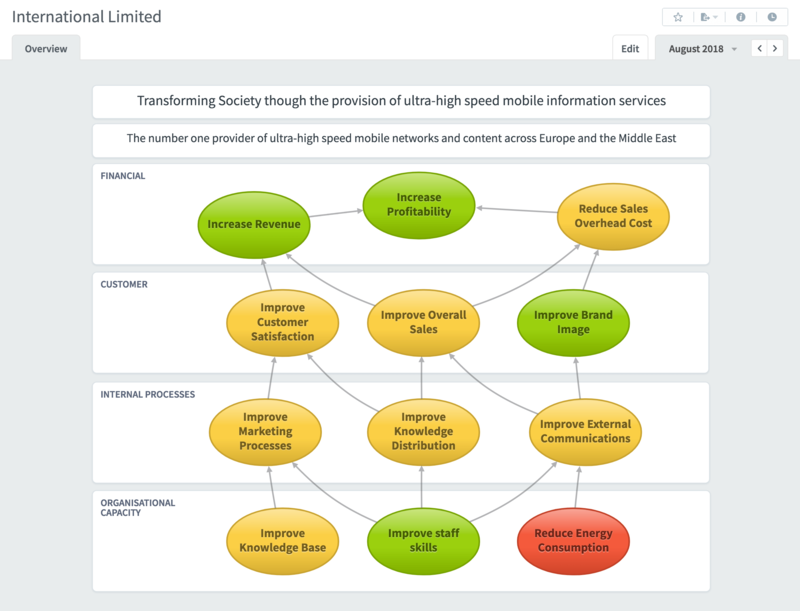 Strategy maps can also be used to track key metrics, visualise geographic data, and monitor trends. An organisation-wide roll-out requires multiple cascaded scorecards. The organisation should start at the top and roll down into department, group, or even to the employee level. Look for products that allow for unlimited cascaded scorecards. Organisations should be able to drill-through to sub-scorecards or individual measure views. The entire organisation should be able to roll-up information from multiple scorecards into higher-level scorecards. Look for products that allow for commentary on each level of the scorecard. It should be possible to create comments that are either general or period specific. Alerts, such as when your metric needs updating (Notification), or when your metric turns Red (Push) are essential communication components. A good solution will allow for “Aligned Objectives” to be easily created so that scorecards can show the performance of their own objectives and measures, or of supporting objectives across various scorecards. Many initiatives will come out of the process. Look for products that have good initiative management modules to manage these scorecard initiatives. It should be possible to create tasks and milestones and assign them to individuals or groups. Getting the right information, to the right people, and at the right time is vitally important. A good solution will come with a built-in report writer that contains canned reports like Red Metrics Report, Grey Metrics Report (missing values), and Metric Comparison Report (compares metrics within and across scorecards). The tools should also allow the user to pull data out of a scorecard database for ad-hoc reporting. The solution should allow the user to export graphs, reports, and scorecards to desktop applications like Adobe Acrobat, Microsoft Word, Excel, and PowerPoint. The tool should be able to create on-line briefings to consolidate data for management, groups, or users. Briefings should be easy to set up by browsing the model and adding views, reports, and graphs. Once the briefing is created, it should be easily viewed online or allow for export to Adobe Acrobat, Microsoft PowerPoint, Word, or Excel. The approach necessitates that the method is adopted by the whole organisation from department to division to enterprise. It becomes a single standard for all. The immediate benefit is a common language, a common set of strategic objectives and common metric structure. This does not mean that the Balanced Scorecard must be implemented across an entire organisation immediately, indeed, the best approach is to start small (usually at the executive level) and roll out over a defined period. The creation of a Strategy Map forces an executive team to think hard about the relationship between a strategic objective, initiatives and the metrics required to both help with the success (leading measures) and determine actual success (trailing measures). 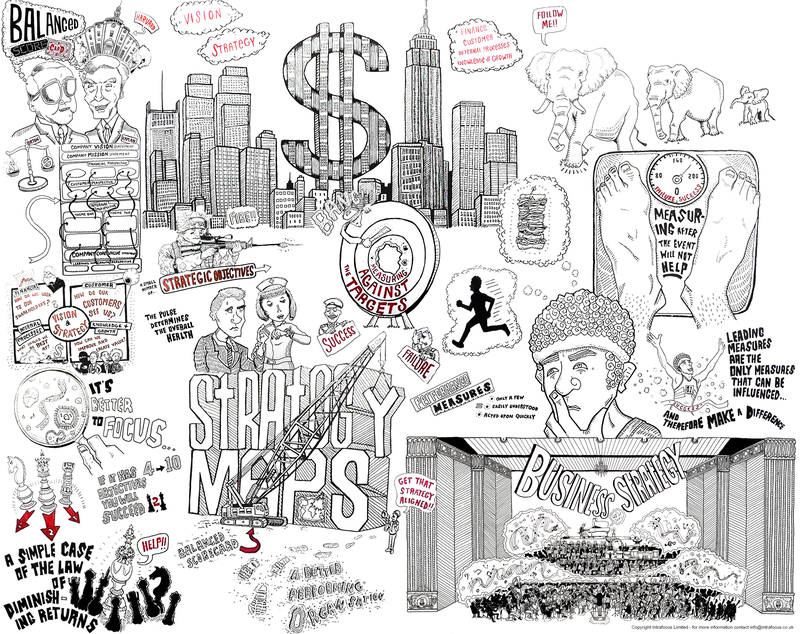 The strategy map, therefore, becomes the cornerstone of strategic planning. It has the added benefit of being the communication medium of the strategy (and the way it will be measured) to the rest of the organisation. The mind is focused on those things that need to be reported to the management and executive teams. There will be other things that need to be measured and reported upon, but the simple fact that the management and executive teams are clear on what they need will cause the whole organisation to think about what is required and more importantly why. One of the obvious benefits of this activity is that unnecessary reporting will be eliminated. The Balanced Scorecard becomes an extremely powerful tool to ensure organisational alignment, to improve communications, achieve much stronger strategic planning and ultimately lead to a better performing organisation that is in-tune with its business strategy. Wikipedia has the best overall description including its history. Download a copy of the final drawing. Read our guide: What is a Balanced Scorecard? The example above is an example of an Integrated Balanced Scorecard. It includes all the elements of a strategy from Vision through to Initiatives. For more information on how to create an integrated strategy go to our Strategy Workshop pages.